May 7th, 2017, the Global Formula Racing combustion car team heads off to Michigan International Speedway to compete in the first competition of the year for GFR17c. Arriving to Michigan on Tuesday the 9th the team started prepping the car for technical inspection and the static events on Thursday. After being given a tech number in the low 100s, we had most of Wednesday to prepare the car as well as prepare for the static events. The team was able to get into technical inspection minutes before they closed for the day being the last car in for tech on Wednesday where we found there were some minor things to be fixed before we could compete in the dynamic events. Thursday was all about statics and getting through tech. With a design time of 9:30 am, that was the first priority. After design, it was back to technical inspection where the car passed with no issues. From tech, it was on to cost report where the team scored 57.6 out of 100 points scoring close to the direct competition. The next priority was going over to pass sound, so while the team with the car went over to sound, our guys went over for the business presentation where they scored us 62.2 of 75 points. After some issues in sound, there were some things to fix before the first day of dynamics on Friday. That evening, design finalists were announced to find out that GFR made it into design finals! Friday started out by going back over to sound so the team could start preparing for the dynamic events on Friday including skid pad, acceleration, and autocross. After some time, sound had been passed and it was onto the tilt test where there were no issues at all. Brake test followed tilt and then the car would be ready for dynamics. After a delay in brakes the team was finally able to pass all inspections and get on to dynamics. Skid pad was first with the first driver going out and putting a good time on the board it was understood what needed to be done to be faster. After some adjustments to the car, the second driver went out and put a time on the board that would be hard to beat with an average time of 4.814, winning skid pad by almost two tenths! With the issues that the team had in sound and brake, it was decided after skid pad to do an autocross run even though the time was not ideal. The first driver went out and did his two laps and put GFR on the top of the time list by about 2.5 seconds for the time being. Now it was on to acceleration where it was only possible to do one run, but with that one run, that put us in 14th with a comfortable gap to our direct competition. 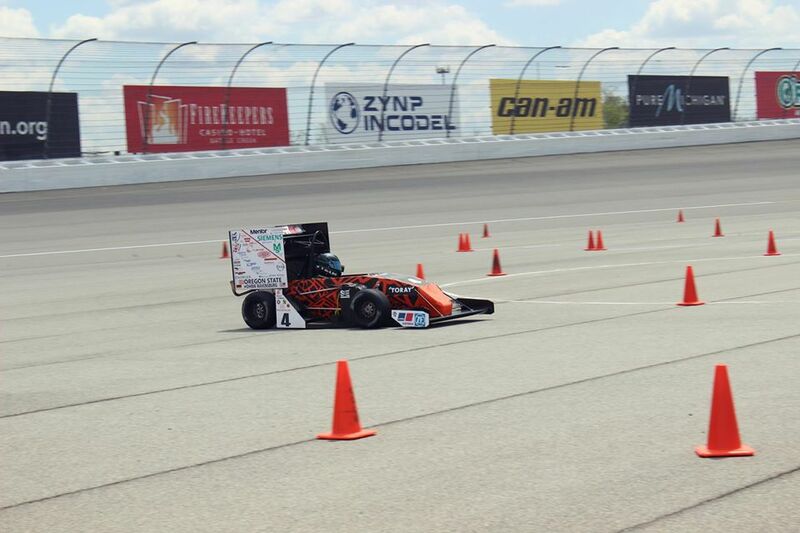 After acceleration, it was back to autocross to try and improve the time we had on the board. Sadly, the second driver couldn’t improve the time and GFR would end up 4th overall in autocross. Following the dynamic events, it was time to prepare for design finals, where GFR scored 121 of 150 points. Saturday the focus was fully on endurance. By setting a 4th place time in autocross, that meant we would be going out for endurance at the end of the day giving the team plenty of time to get the car ready. So, after the car had been fueled up it was time to go! The two endurance drivers had a good endurance run with hitting zero cones and with no failures on the car, GFR17c completed it s first competition endurance which is something to be proud of scoring 247.2 out of 400 possible points. Efficiency was the final box to check before competition was over where GFR scored 99.9 of 100 points, putting all the top teams very close in terms of overall points. Going into the awards, there were lots of unsure faces but when Global Formula Racing was called up to accept the second-place trophy, those unsure faces turned into faces of joy! The second place at Formula SAE Michigan is a great way to start the season and there will be plenty of work going in to make sure GFR can do one spot better at FSA and FSG.